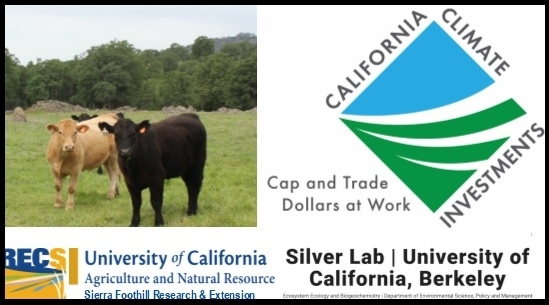 UC Sierra Foothill REC is hosting a community workshop & field demonstration event where The Silver Lab at UC Berkeley will discuss results from a long-term (10 year) compost addition trial on foothill rangeland and observed benefits for forage quality, quantity, and soil health characteristics. At this event, researchers will also be spreading compost for a new project supported by the 2017 Healthy Soils Demonstration Project and funded by Greenhouse Gas Reduction Funds and part of California Climate Investments. 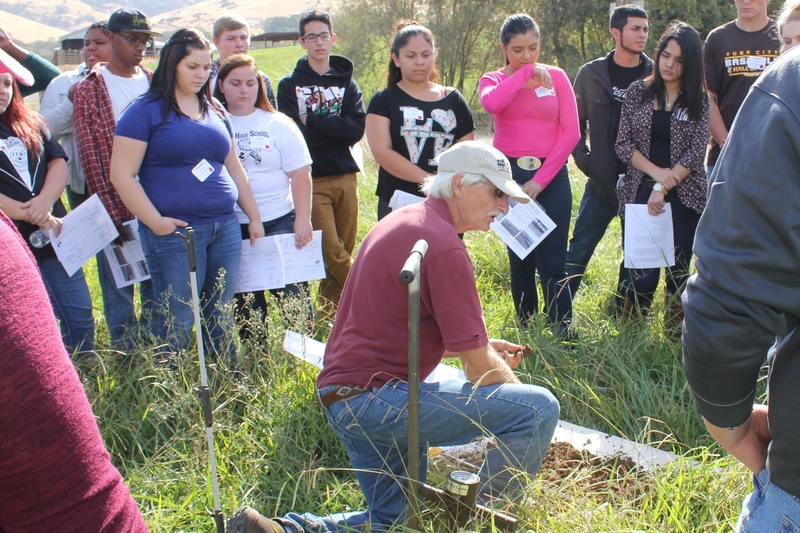 All are welcome to attend - Get more info by calling 530-639-8800 or emailing Jeremy James at jjjames@ucanr.edu. 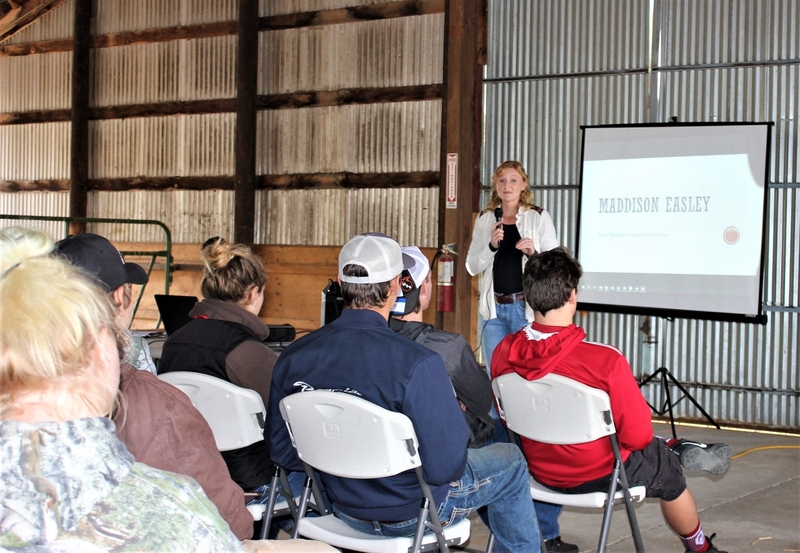 Maddison Easley gives a keynote address to students at 2018 Beef & Range Field Day. 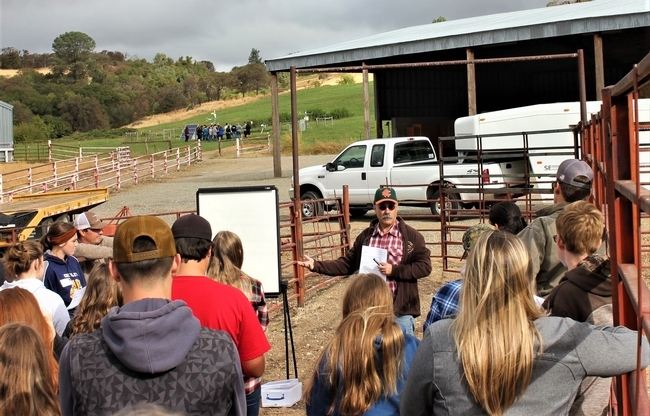 On Thursday October 4th, Sierra Foothill REC hosted its 5th Annual Beef & Range Field Day for high school students enrolled in FFA & 4-H. Following an inspirational keynote address discussing possibilities after high school in research and agricultural careers by Maddison Easley of Placer County Resource Conservation District, the 112 students and their 10 FFA teachers enjoyed the remainder of the day participating in four different outdoor learning stations. 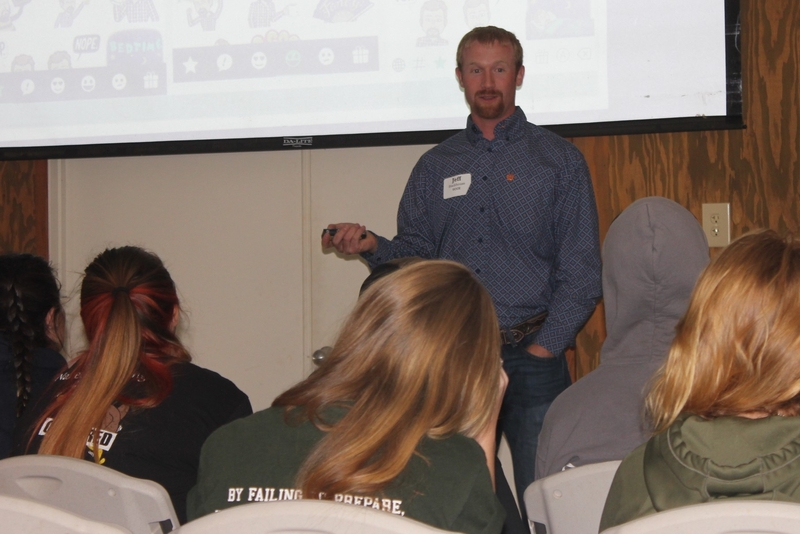 Dan Macon talks to students about low-stress cattle stockmanship methods. 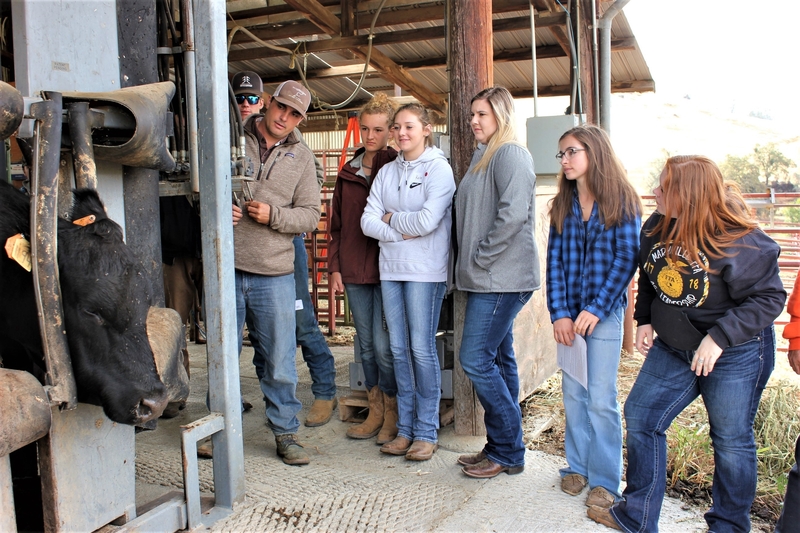 Dan Macon, Cooperative Extension Advisor, and SFREC's own Clint Tipton, gave an engaging demonstration of low-stress cattle stockmanship, teaching students about flight and pressure zones and showing off all the bells and whistles of the SFREC hydraulic cattle chute. Clint Tipton shows students the hydraulic cattle chute. Dr. Gaby Maier prepares for students to look through the microscope to learn more about ruminant digestion. Dr. Gaby Maier of UC Davis Veterinary Medicine gave students a closer look inside cattle with her presentation station discussing ruminant digestion and nutrition. 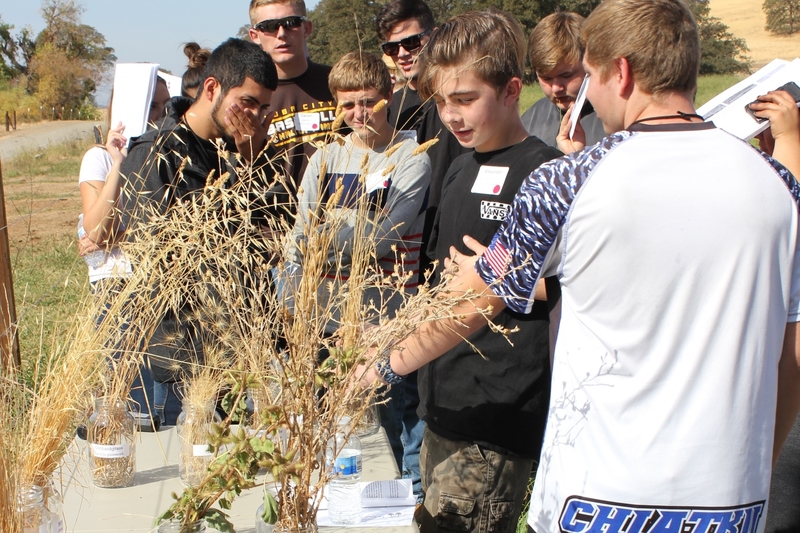 Students were able to look at gut flora and different types of feed. Dr. Sam Sandoval has students pouring water into the groundwater simulator model. 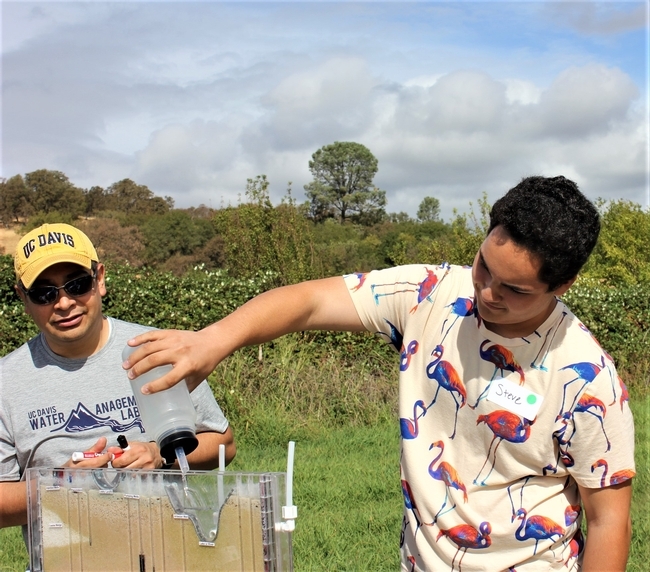 Dr. Sam Sandoval & Dr. Romina Diaz Gomez of the UC Davis Department of Land, Air & Water Resources brought watershed sciences to life with an interactive plexiglass model that demonstrates the movement and flow of groundwater. 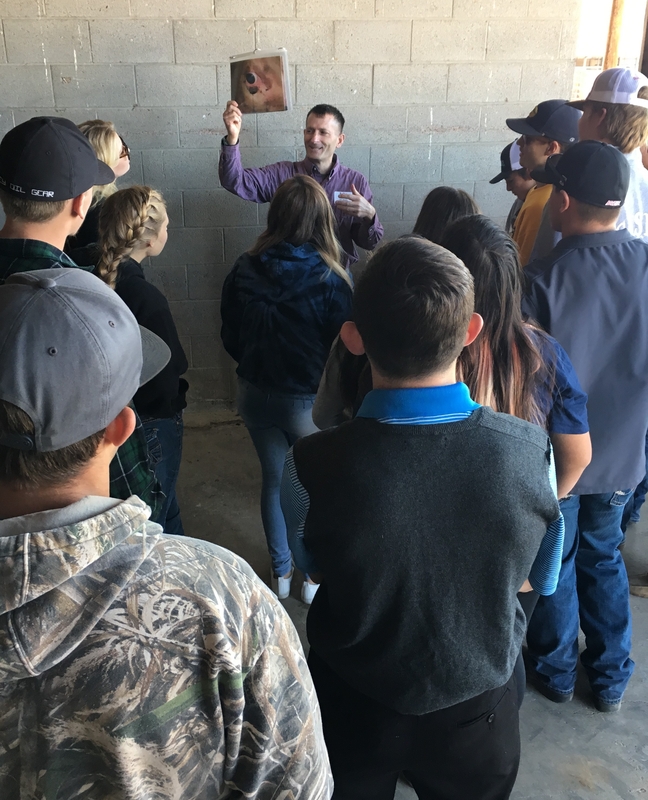 SFREC's Director, Jeremy James gave the students an eye-opening tour of SFREC's CIMIS weather station equipment and how changes in climate patterns over time effect California's natural oak woodlands, grasslands and agricultural industries. 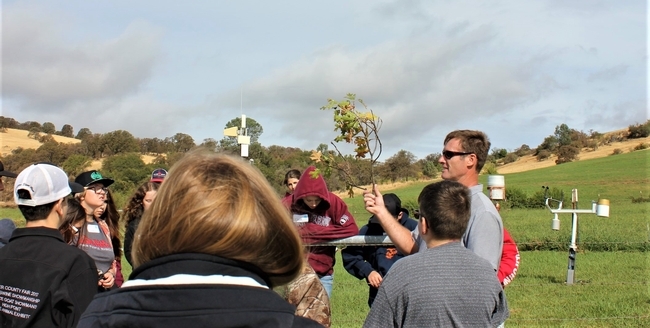 Jeremy James shows students SFREC CIMIS weather station equipment and how it relates to natural landscapes & agriculture. 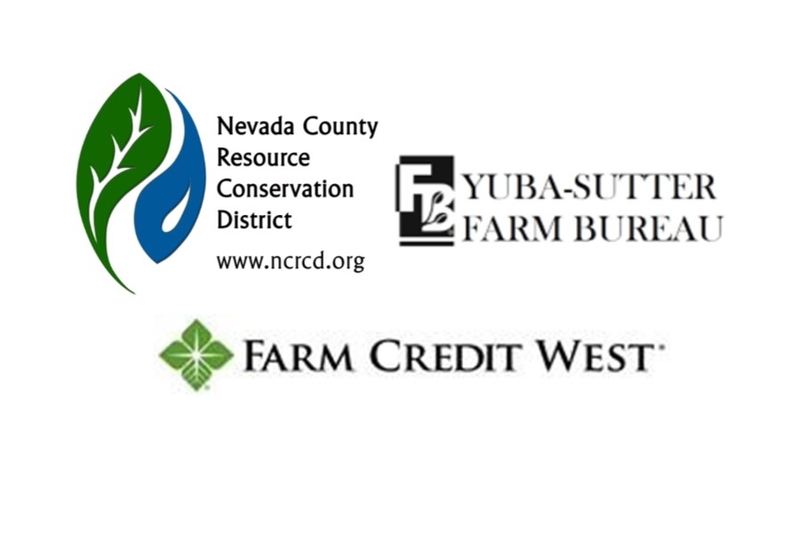 A special thank you to this year's event sponsors Farm Credit West, Nevada County Resource Conservation District & Yuba-Sutter Farm Bureau. 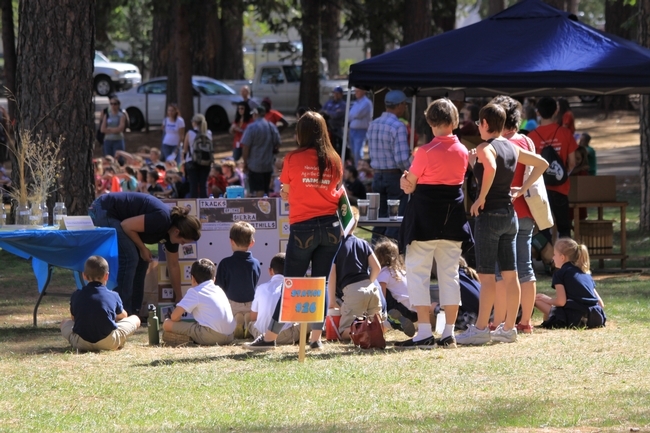 Additional thanks to Nevada County Resource Conservation District for sending out two volunteers to help facilitate this year's event. On Wednesday, October 5th, SFREC hosted over 170 high school students enrolled in FFA and 4-H programs across six counties for the 3rd Annual Beef & Range Field Day. 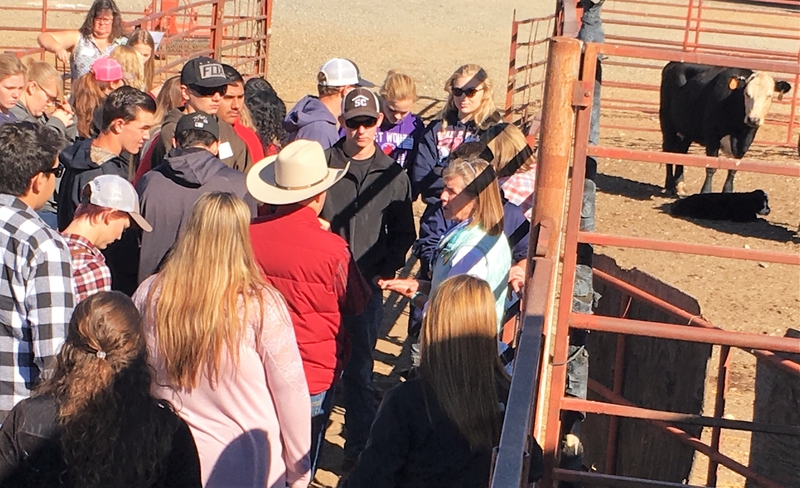 Students had the unique opportunity to engage with UC researchers and industry leaders, exploring key topics related to beef cattle and rangeland management. The field day kicked off with a keynote address by Congressman, John Garamendi (CA-3), who spoke with students about the roles they will be able to pursue within agriculture and food productution as they chart out their future careers. 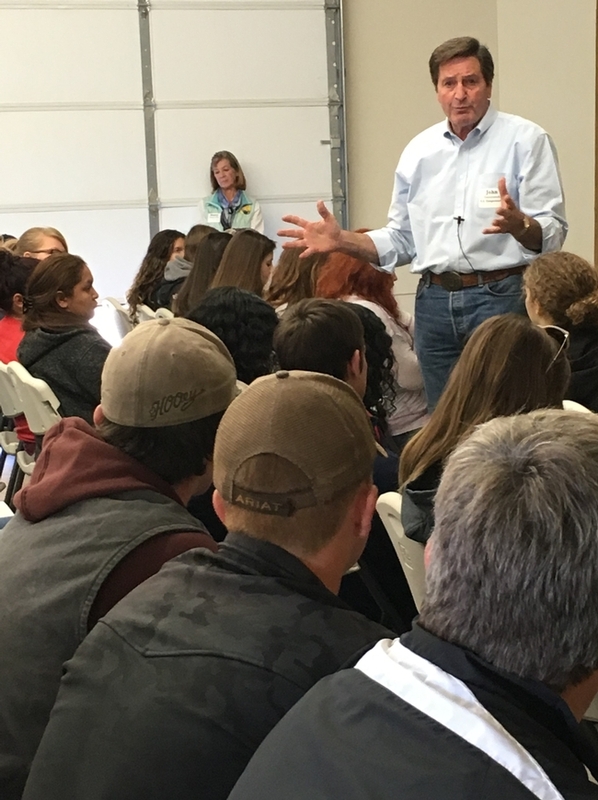 Garamendi encouraged his audience to think outside of the box when it comes to creating solutions to the many challenges agriculture will face in years to come. Following this address the students rotated through five hands-on learning demonstrations developed by UC researchers that explored major topics in beef cattle and rangeland management. 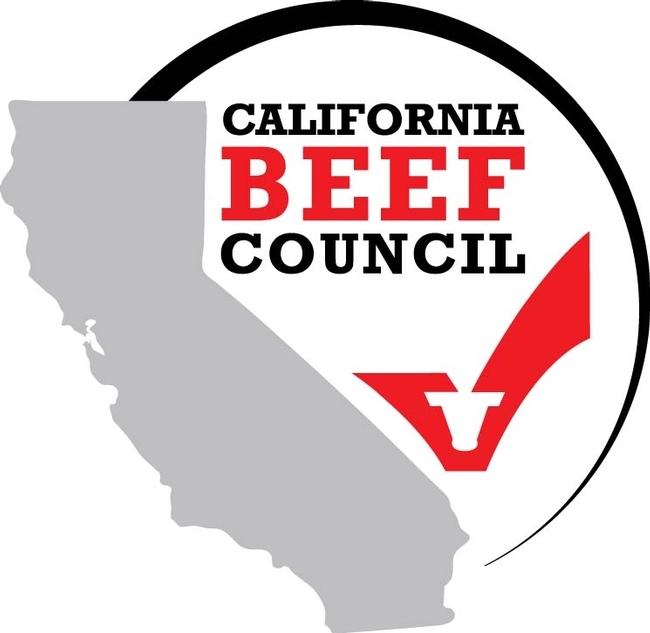 Dr. Nancy Martin, DVM, discussed health issues in beef cattle with Dr. John Angelos from the UC Davis School of Veterinary Medicine following up by highlighting his research in the development of a vaccine for pink eye in cattle. UCCE Farm Advisor, Jeff Stackhouse discussed the use of technology in managing livestock and wildlife, while Dr. Roberto Sainz of the UC Davis Department of Animal Science explored the ruminant digestive system. 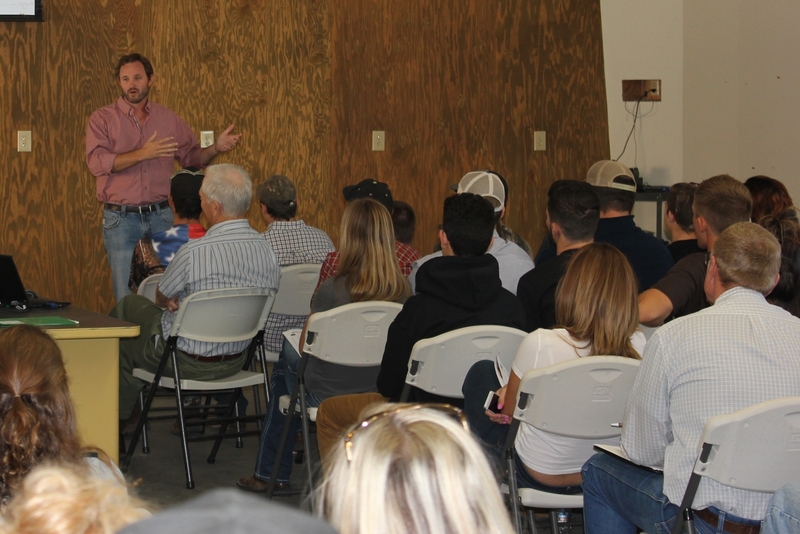 Roger Ingram, UCCE Advisor in Placer/Nevada/Yuba & Sutter counties demonstrated principles related to dryland and irrigated pasture management. Students had the opportunity to evaluate soil properties, classify rangeland plants and observe beef cattle grazing behavior. 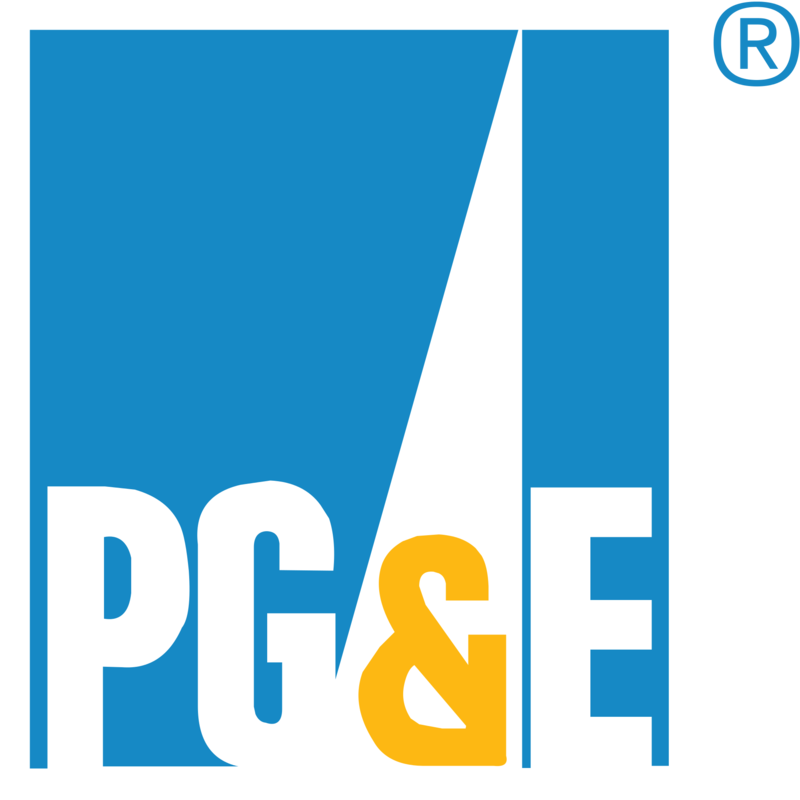 This event was made possible by the following Sponsors: PG&E, Yuba-Sutter Farm Bureau, California Beef Council and Farm Credit West. We are grateful for this generous support. 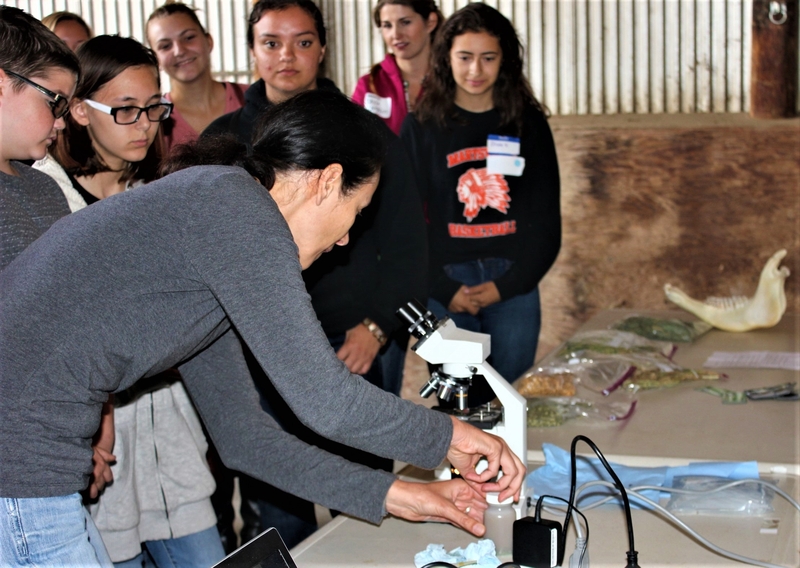 The time donated by FFA leaders and UC staff was instrumental in making the third year of this annual event a major success and a great opportunity for students to interact with ongoing research led by the University of California. 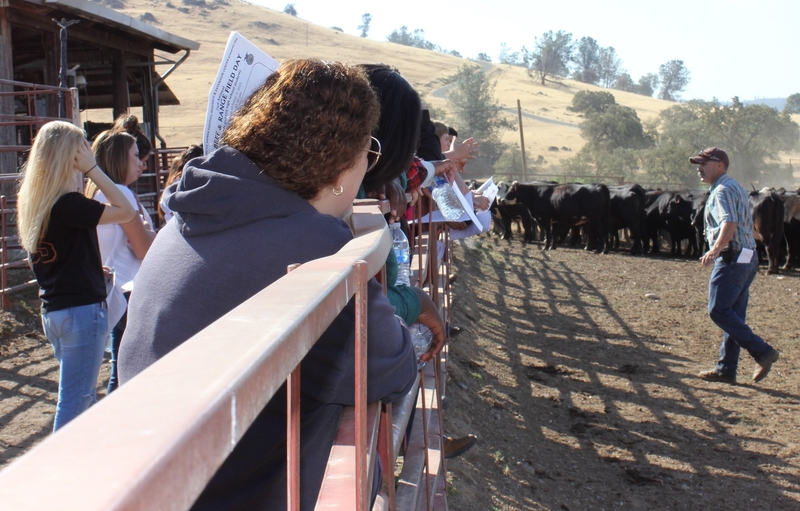 Dr. Nancy Martin, DVM works with students to assess the health of several cow-calf pair. 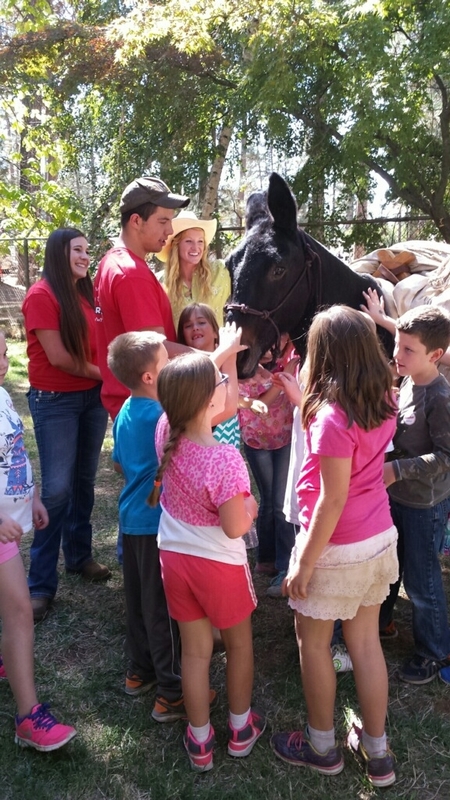 Thursday, September 24th, 2015, marked the first annual county-wide Farm Day held at the Nevada County Fairgrounds in conjunction with the start of the esteemed Draft Horse Classic. This keystone event was a significant feat not simply because more than 700 young students from all parts of Nevada County participated, but also due to the impressive teamwork that brought together over 25 different groups, agencies, farms, ranches, professionals and non-profit organizations. 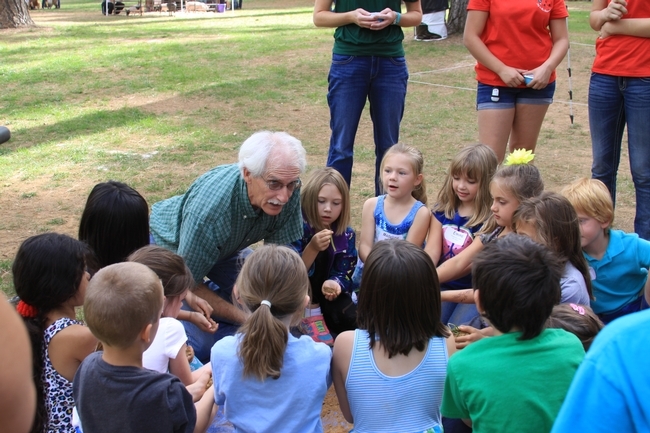 Children ranging from kindergarten to third grade, accompanied by teachers and chaperons, feasted on the plethora of activities, sites, sounds, and information focused on a wide array of agricultural and natural resource related topics. Presenters covered important - and often under represented - facets of agricultural livelihoods, opportunities, issues and practices. A few implements and sights many children had never experienced up close included a genuine saw mill, an apple cider press, a pack mule, a welding trailer, a hive of bees, an assortment of livestock, a grain winnower and even a team of draft horses with a restored pioneer wagon. 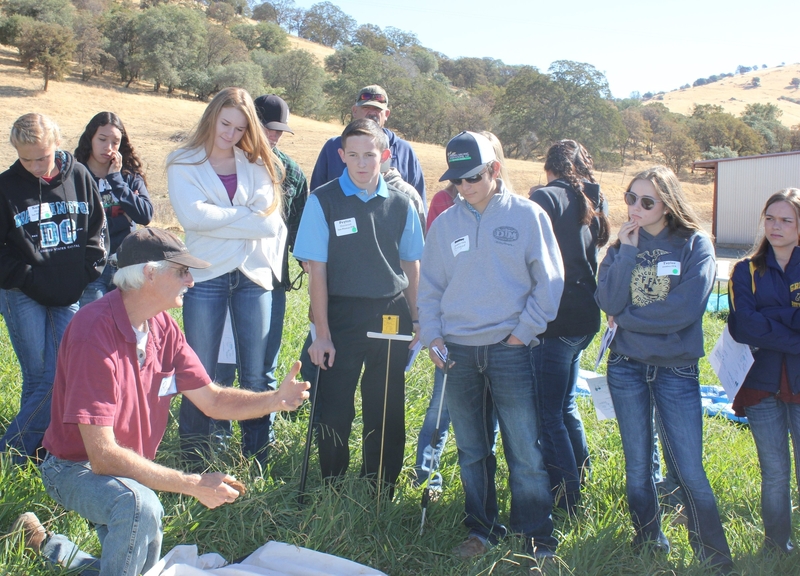 Groups involved included the following: Sierra Foothill Audubon Society, Nevada County UCCE, 4-H Youth Development, Nevada Irrigation District (NID), Placer-Nevada Cattlewomen, Future Farmers of America (FFA), Sierra Harvest, California Native Plant Society, UC Master Gardeners, Bear Yuba Land Trust, Nevada County Fiber Guild, Nevada County Farm Bureau, NRCS, Nevada County Resource Conservation District (RCD) and of course the UC Sierra Foothill Research and Extension Center (SFREC), along with numerous other local farmers, ranchers and professionals. Janet Blake, with the Nevada County RCD, along with Karen Henderson, retired agriculture teacher and LiveWire manager, led this collaborative effort in conjunction with members from the community, including Megan Osbourn and Jeremy James of UC SFREC. The focus of Farm Day was primarily to expose children to the realities of agricultural enterprises and natural resource management, a significant objective which was achieved with outstanding success. 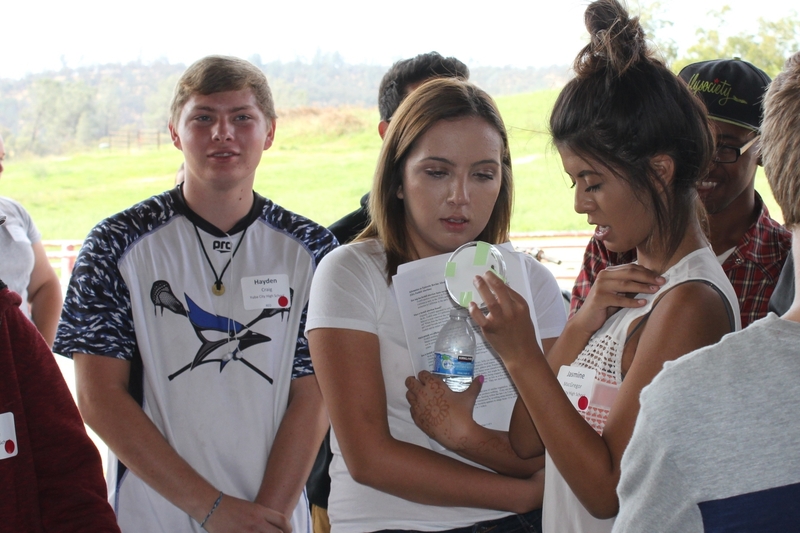 Through the planning and implementation of the event, an additional valuable outcome was the unification of a wide array of entities and individuals to work toward a meaningful and powerful goal – hands-on learning. 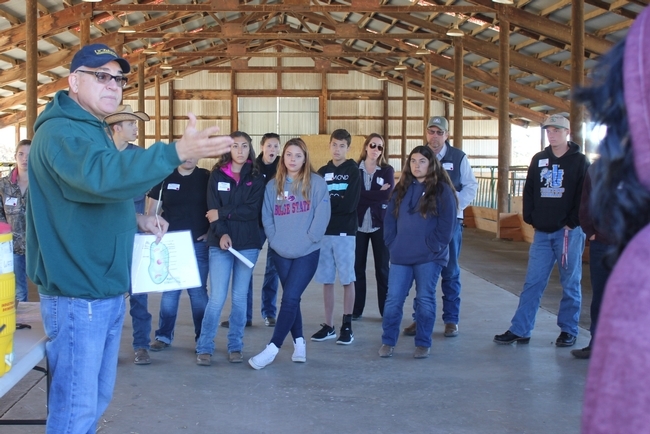 The interactions made with the hundreds of youth (as well as adults) through the first annual Farm Day opened the door for additional conversations, pursuits and possibly even career ideas. While these students may have over a decade before entering the professional world, the fires lit and rekindled in their excited minds will certainly simmer for years to come. 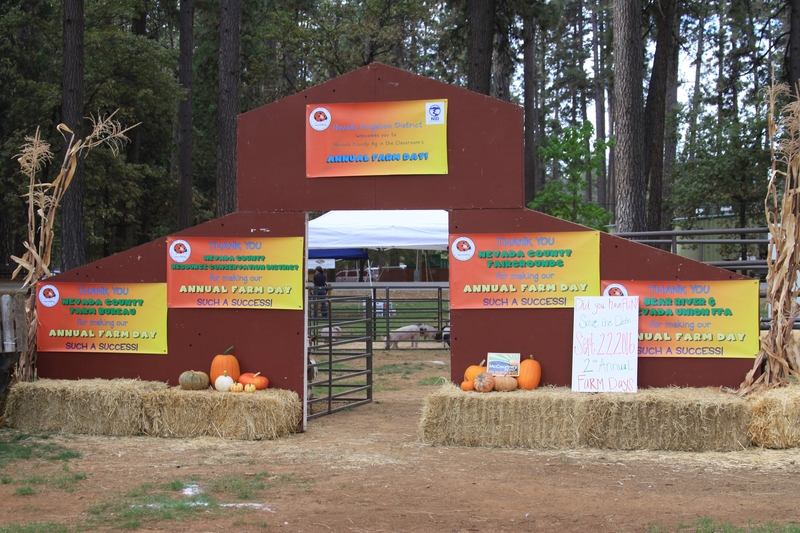 In the meantime, the second annual Nevada County Farm Day is on the calendar for Thursday, September 22nd, 2016. UC SFREC will also be participating in the Yuba-Sutter Farm Day at the Yuba-Sutter Fairgrounds on Friday, October 2nd, 2015. Be on the lookout for a follow-up post in the near future.